Alcohol dependence, or alcoholism, is characterized by increasing tolerance, cravings and withdrawal symptoms. When alcohol is absorbed into the bloodstream from the digestive tract, it is quickly distributed to all parts of the body and has effects on all major systems, including the skin. Excessive alcohol use may also impact skin health by affecting personal grooming habits and nutrition. Alcohol abuse is associated with several skin disorders. Skin symptoms may be recognizable at an early stage of the disease and be useful in the diagnosis of alcoholism. A flushing reaction to drinking alcohol, which is due to an enzyme deficiency and more common in those of East Asian descent, has been linked to an increased risk of alcohol-induced esophageal cancer by scientists from the National Institute on Alcohol Abuse and Alcoholism. The conclusions were made from a review of studies and announced by "NIH Health" on March 23, 2009. Other skin conditions common in alcoholics may include hives and a worsening of existing rosacea, a disorder characterized by redness, pimple-like bumps and thickening skin on the nose and cheeks. Long-term alcohol abuse is one of the most common causes of liver scarring, or cirrhosis. The liver normally processes dietary proteins, carbohydrates, fats and vitamins, produces clotting factors and breaks down toxins in the blood. Impaired liver function may result in redness or mottling on the palms of the hands. Skin may bruise easily and itch all over. Other symptoms of cirrhosis may include yellowed complexion and the appearance of spider veins on the trunk, face, arms and hands. The American Academy of Family Physicians states that the number and size of spider veins can be correlated to the severity of chronic liver disease. Heavy drinkers are more likely to have psoriasis than nondrinkers, and alcohol intake is known to exacerbate existing psoriasis. As part of the Nurses Health Study II, researchers looked for an association between new cases of psoriasis and alcohol use. A group of 82,869 women who reported they drank alcohol and had no history of psoriasis were followed for 14 years, beginning in 1991. Of the group, 1,150 developed psoriasis, a significantly higher rate than nondrinkers in an original cohort of 116,671 women. 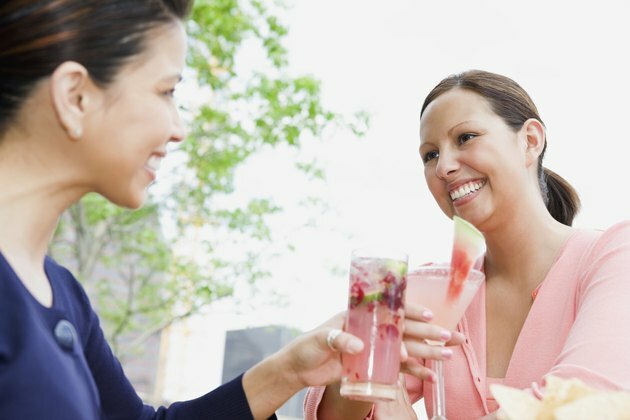 Subjects who developed psoriasis reported drinking 2 to 3 drinks per week or more. An association between psoriasis and drinking regular beer was strongest in a subset of women who drank 5 or more drinks per week, while light beer and other forms of alcohol were not shown to be a significant risk for new cases of psoriasis in this study. Scientists do not know exactly how alcohol influences psoriasis, but theorize that immunological changes, increased inflammation or sensitivity to gluten in the barley that's used to make beer may be causative. The findings were published in the August 2010 issue of the journal "Archives of Dermatology." Does Peanut Butter Cause Pimples?